1968 Pontiac GTO Hardtops. Lot 1 of 83. CLICK-> Orange 1968 GTO hardtop with a black vinyl top. Check out the front license plate on this one. 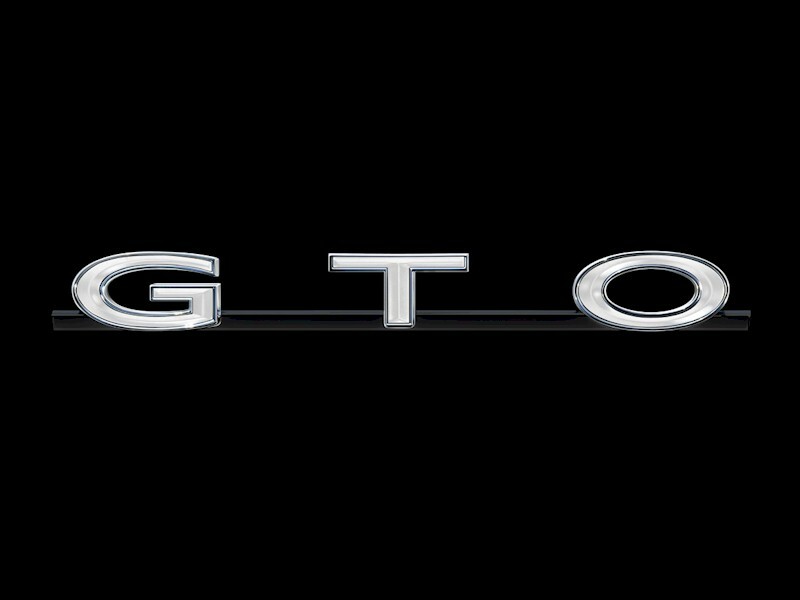 Pontiac created a new rubber/plastic material called Endura to mold the front bumper of the GTO in 1968. This material could be painted body color. It has a 'memory' and would return to it's original shape in a few minutes. It is fire, heat, solvent resistant. If you want mix up some Endura in your basement, you will need acrylonitrule, butadiene, and styrene. How do you paint it? Back in 1968 Pontiac developed a special paint that was sprayed into the mold used to create the bumper. This paint stuck to the Endura when it was injected into the mold. Great, but how do you paint it now-a-days? You must add a flex agent (Elastomer) to the paint to allow it to flex with the Endura. The flex agent will eventually get hard after five or so years and crack. When it cracks, borrow a crayon from your kids (same color as your paint) and press it into the cracks. CLICK-> Roger Klingensmith wanted to make sure an April Gold Goat made it on this page. He lives in Illinois. He bought the car from Globe Arizona. This car has Ivy Gold interior. It has a 400 stock engine except stainless valves and 068 cam and HO exhaust manifolds. The exhaust is 2-1/2 inch aluminum with an "H" pipe through Dynomax super turbos. It's an automatic with a/c and power steering and brakes (soon to be dual piston disk). The rear ratio is 2:93 due to a/c but will soon be 3:23. It has rally gauges and clock, am radio and 8-track. Recent upgrades are a rebuild to the TH400 (M40) transmission. Turbo Terry in Chicago installed Heavy Duty Raybestos Bands and Clutch Pack along with a very snappy shift kit and deep sump pan. The Four Piston Calipers and two piece rotors turned out to be problem prone, even with stainless sleeved pistons, so Roger might switch to Stainless Steel Brake Corporation's calipers and crossed drilled one piece rotors. CLICK-> Aleutian Blue 1968 GTO hardtop with the Endura Delete (chrome) front bumper. It's owned by Michael J. Murphy from Huntsville, Alabama. 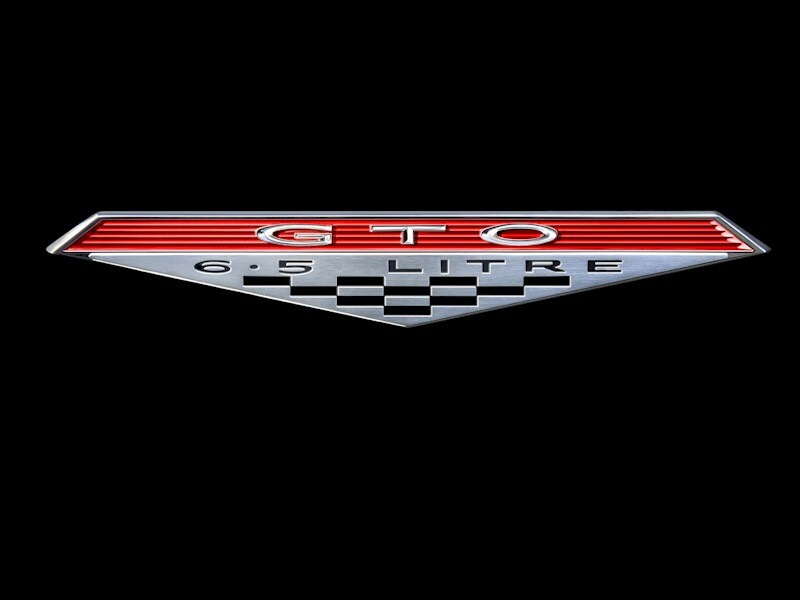 The 1968 GTO could be ordered without the body colored Endura bumper. 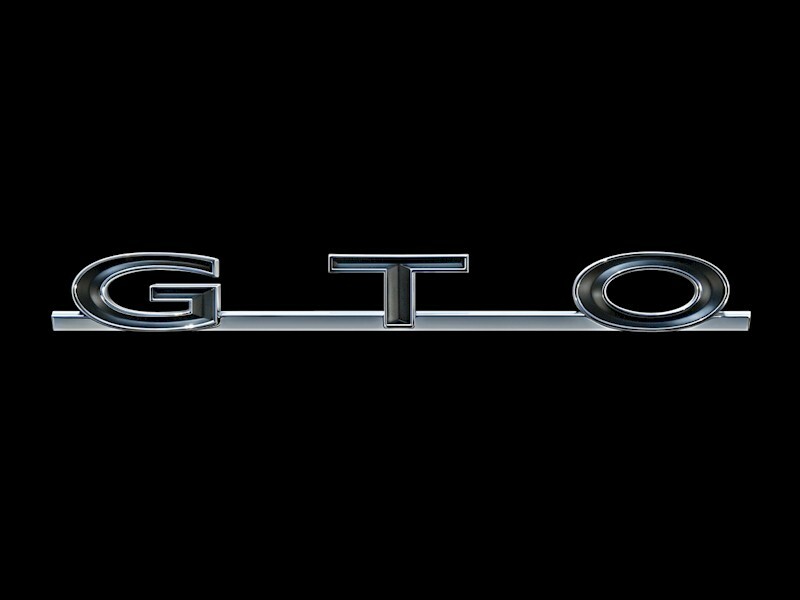 Michael tells this story, "This GTO was bought by my Dad after he drove my 67 GTO. It has spent most of its life in garages. The car is completely original except for the Cragar SS mags. My Dad ordered the chrome bumper because he didn't believe that the Endura bumper would hold up. The car has the 350hp 400ci engine, 4-speed transmission, and the 3.55 open rear." CLICK-> Aleutian Blue 1968 GTO hardtop, right rear view. There were five shades of blue that could be selected for the 1968 GTO. Use the Stats Explorer ™ to see all the colors the 1968 GTO could be ordered in. CLICK-> The interior in Michael's Aleutian Blue 1968 GTO hardtop is Teal Blue. There were two different blue colored interior offered in 1968. Use the Stats Explorer ™ to see all the interior colors offered on the 1968 GTO. There's a factory 8-Track Tape Player in this one. CLICK-> Here's a close up of the dash. This one has the basic instrumentation package. The instrument pod on the far left has the fuel gauge as well as idiot lights for oil pressure, alternator voltage, and water temperature. The middle pod has the speedometer and odometer. The far right pod is empty. This pod would hold the optional Rally Clock or Tachometer. CLICK-> Aleutian Blue 1968 GTO hardtop, trunk view. This is the correct position for the spare tire in the 1968 GTO. It's an annoying position as it cuts down on trunk space. It would have been nice to mount up against the rear seat as with the full size Pontiacs of that year. CLICK-> Aleutian Blue 1968 GTO hardtop, engine view. CLICK-> Here is an updated picture of Michael's Aleutian Blue 1968 GTO hardtop. He swapped out the Cragars for a restored set of 15x7 Rally II wheels. CLICK-> Michael has cleaned the engine compartment and repainted/restored items that were worn. CLICK-> One fine example! 1968 Verdoro Green GTO from Arkansas has black vinyl top. Owned by Jeff Pund who used to live in Rogers, Arkansas. This one has Cragars and a hood tachometer. This car is also pictured at the 1997 POCI car show. The link to show coverage is in the main menu at the bottom of most pages. Jeff sold the car in 2000 and is now looking for a 1974 GTO to drag race. He sold the car to a gentleman named John Walker in South Carolina. 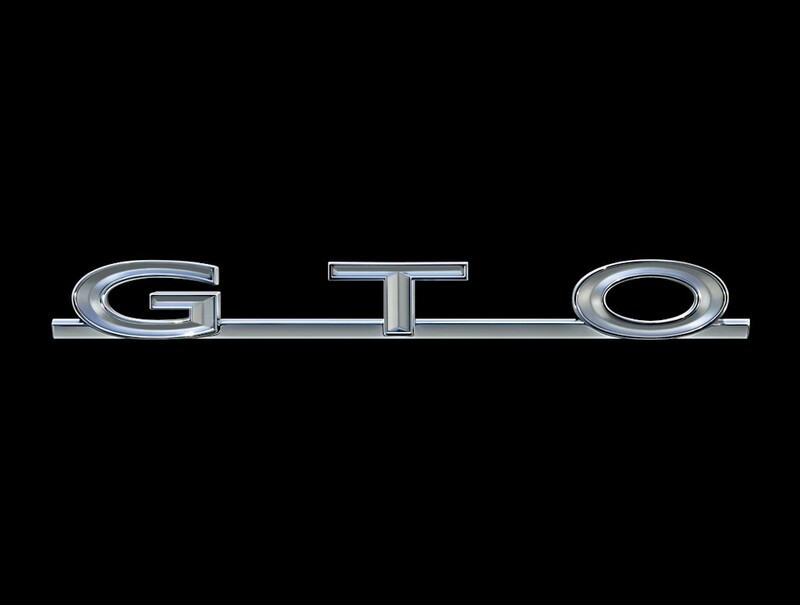 CLICK-> This is a nice clear picture of a white GTO emblem. These are used on the grilles of most classic GTOs as well as the trunk lid of dark painted GTOs. We have this one in two additional sizes; 800-600 wallpaper and 1024-768 wallpaper. To get them, click on the links, then right-click on the image, and select "Set as Background". CLICK-> Silver (un-painted) GTO emblem. Painted version of these are used on the grilles of most classic GTOs as well as the trunk lid. We have this one in two additional sizes; 800-600 wallpaper and 1024-768 wallpaper. 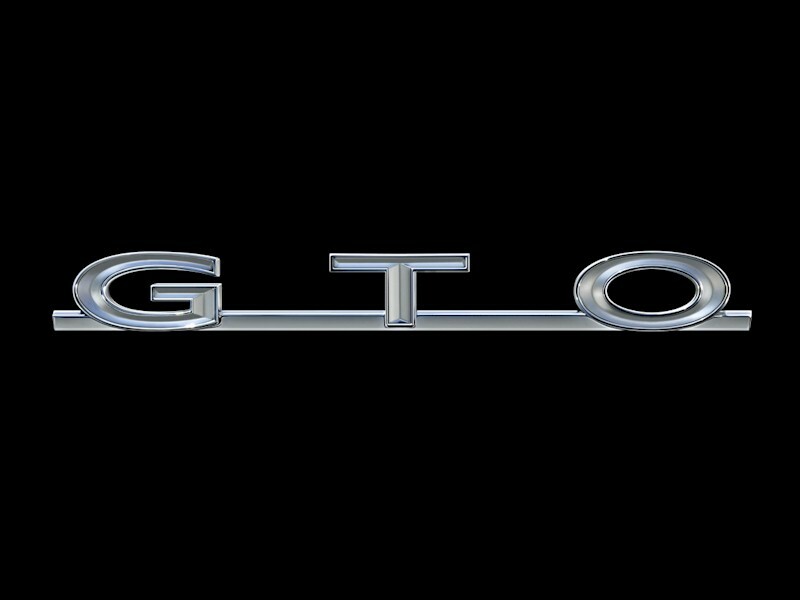 CLICK-> Black GTO emblem. These are used on the trunk lids on light painted GTOs. We have this one in two additional sizes; 800-600 wallpaper and 1024-768 wallpaper. 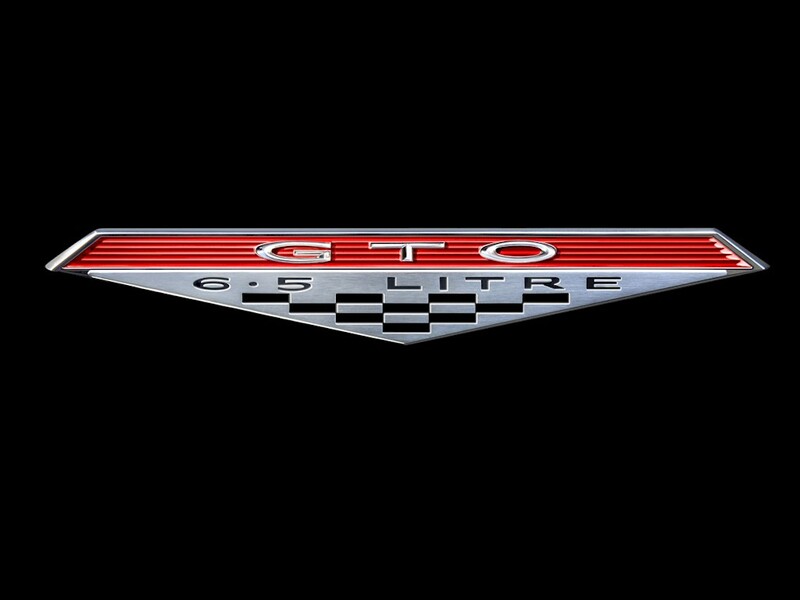 CLICK-> Classic 6.5L GTO emblem. These are used on the fenders of 1964-1968 GTOs. We have this one in two additional sizes; 800-600 wallpaper and 1024-768 wallpaper. Says Steve Lazanas (ls6m22. @att.net) - "I find the site very useful. I have been a Chevy guy for a long time, and now I am interested in learning about Pontiacs."